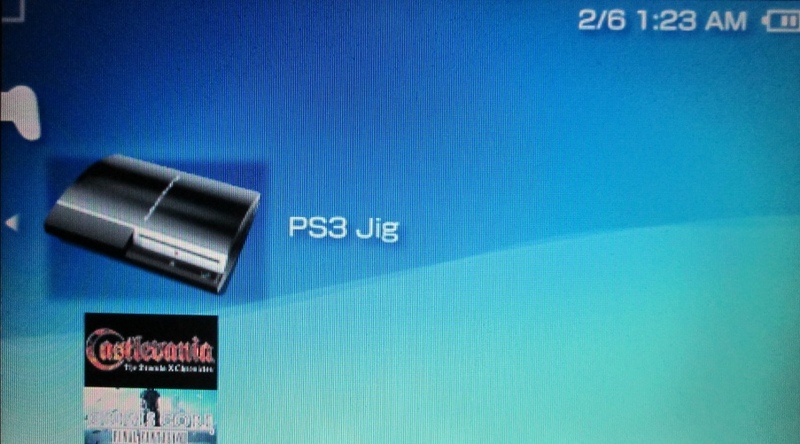 PS3Jig is a homebrew program for the PSP that emulates the official Sony "jig" stick for entering Factory/Service mode. All you need to do is attach a USB cable between your PS3 and PSP, run the program, and turn on your PS3, just like any other downgrade/service mode method. AS OF THIS WRITING, THERE IS NO WAY TO EXIT FACTORY/SERVICE MODE ON PS3 FIRMWARE VERSION 3.56, SO DO NOT ATTEMPT TO USE THIS ON PS3 FIRMWARE VERSION 3.56 UNTIL YOU READ OTHERWISE ELSEWHERE! Keep in mind that I'm not a PSP developer, and that I know very little about homebrew for it; my ability to answer questions about how to run it and troubleshoot any issues is severely limited. This application is open source and has no license attached to it, so you're free to do whatever you want with it; but please don't slap your name on it and call it your own, it's just rude. What's the main purpose of this? To enter Factory/Service Mode on your PS3 using your PSP. This is typically used to downgrade your PS3's firmware version to something that supports homebrew/backups, or you can use it to unbrick some PS3s from a firmware flash gone bad (NOT Waninkoko bricks -- only from unsuccessful downgrade attempts). Will this cause any permanent damage to my PSP? Not that I know of. I don't see how it possibly could, but don't blame me if it does. Do I need a special cable for this? No, you just need a standard A<->mini-B USB cable. Among many other uses, it's the cable used to charge/sync PS3 controllers. You have one of these. What firmware version does my PS3 need to be on for this to work? As of this writing, you need to be on firmware version 3.55 or earlier. DO NOT USE IT ON FIRMWARE VERSION 3.56 OR HIGHER UNTIL YOU READ OTHERWISE ELSEWHERE. What firmware version does my PSP need to be on for this to work? Honestly, I don't know. This requires kernel mode, so as of this writing (and to the best of my knowledge), version 6.35 or lower. It runs on my PSP-1001 5.50 GEN-D. I am looking into getting it to run on others, but I only have one PSP to test with. 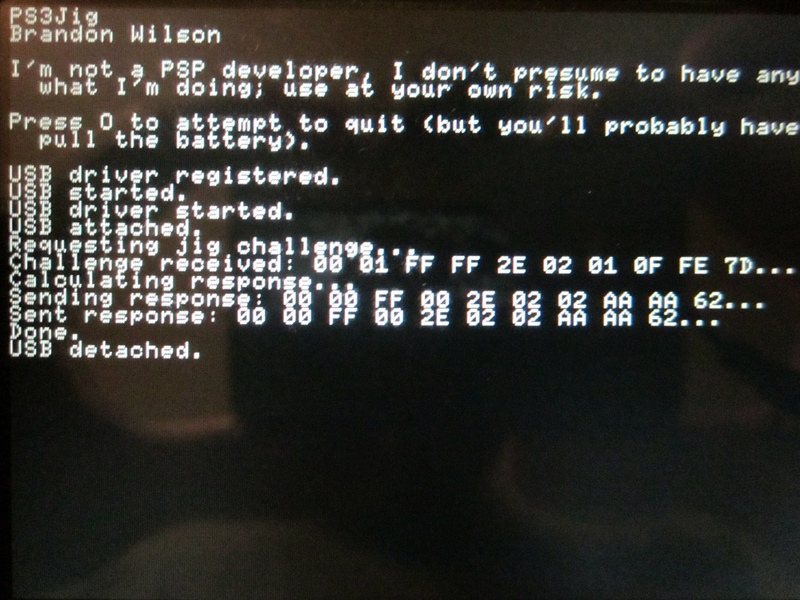 I get an error when I run it on the PSP! What's wrong? How do I get this on my PSP? The same way you do with any other PSP homebrew. Do some reading and/or googling. It didn't work! What's wrong?! Try it multiple times. I have noticed through a hardware USB analyzer that sometimes the PSP doesn't send the jig challenge response correctly, despite the PSP saying it did. I am looking into this. Will this work on the PSP Slim? 2000? 3000? I think that it might, but I don't have a Slim so I can't test to confirm. It locked up my PSP when I tried to exit! Why? I honestly don't know. Pull the battery, re-insert it, and turn it back on. I am looking into this bug. What tools did you use to compile/build this? Where's the latest source at? What dongle ID does this use? 0xAAAA. It can easily be changed and re-compiled in the source. I didn't provide a UI for it because it's unlikely anyone will ever need to change it. You know, you're really late on this. I thought you said this couldn't be done! And yet here it is, prick. What's with the lying? I said you couldn't implement the PSGroove/PSJailbreak exploit on it, and that's still true. Emulating the Sony official jig stick for Factory/Service Mode is different, and the PSP can do it. I didn't see anyone else doing it, so I did. How can I scream at you / profess my undying love / throw money at you via PayPal / give a simple thanks / etc. ?